Bartlesville is a city mostly in Washington County in the U.S. state of Oklahoma. The population was 35,750 at the 2010 census, with a 2015 estimate of 36,595 according to the U.S. Census Bureau. Bartlesville is 47 miles (76 km) north of Tulsa and 18 miles (29 km) south of the Kansas border. It is the county seat of Washington County. The Caney River runs through Bartlesville. Bartlesville is the primary city of the Bartlesville Micropolitan area, which consists of Washington County and had a population of 52,021 in 2015. A small portion of the city is in Osage County. The city is also part of the Tulsa Combined Statistical Area, with a population of 1,151,172 in 2015. Bartlesville is notable as the longtime home of Phillips Petroleum Company. Frank Phillips founded Phillips Petroleum in Bartlesville in 1905 when the area was still an Indian Territory. The company merged with Conoco as ConocoPhillips and later split into the two independent companies, Phillips 66 and ConocoPhillips. Both companies have retained some operations in Bartlesville, but they have moved their corporate headquarters to Houston. It is one of two places in Oklahoma where a Lenape Native American tribe lives, the other being Anadarko. Jacob Bartles, son-in-law of Delaware chief Charles Journeycake, moved from Wyandotte County, Kansas, to Indian Territory in 1873. He settled first at Silver Lake, a natural lake south of the present city of Bartlesville. In 1874, he opened a trading post and post office on Turkey Creek, in what is now East Bartlesville. In the following year, he bought a grist mill on the Caney River and modified it to produce flour. Bartles then built a two-story general store and residence, and added a rooming house, a blacksmith shop and a livery stable. Other settlers soon moved into the immediate area, which was then called Bartles Town. In 1880, Bartles moved his Turkey Creek post office to this town. Bartles then provided the community with electricity, a telephone system and a water distribution system. Development of the present city began after William Johnstone and George B. Keeler opened a general store on the south side of the Caney River in 1884. The first newspaper, The Weekly Magnet, began publication in March 1895. The town was incorporated in Indian Territory in January 1897. The town was surveyed and platted in 1898, and eighty acres were offered to the Atchison, Topeka and Santa Fe Railroad for a depot. The railroad reached the town in 1899. The post office was moved from "North Bartlesville" in 1899. Bypassed by the railroad, Jacob Bartles moved his store to Dewey, Oklahoma. Bartlesville was originally a sundown town where African Americans were not allowed to live. By 1907, the restriction had been lifted, and newspapers noted the town's first natural death of an African American, a man named Robert McGee. In 1957, Bartlesville was the test site for the first experiment in pay cable television. The Bartlesville Telemovie System debuted with the film The Pajama Game, starring Doris Day, and aired it to an audience of 300 homes. The headline of the September 4, 1957, issue of Variety read, "First-Run Films Now at Home". Bartlesville is located at 36°44′50″N 95°57′34″W﻿ / ﻿36.74722°N 95.95944°W﻿ / 36.74722; -95.95944 (36.747193, -95.959498). According to the United States Census Bureau, the city has a total area of 21.1 square miles (54.6 km2), of which 21.1 square miles (54.6 km2) is land and 0.04 square miles (0.1 km2) (0.09%) is water. The Caney River flows through Bartlesville, separating the downtown area from the east side. The river flooded in October 1986 as a result of unusually heavy rainfall. The city was split in half for several days, and the flood caused considerable property damage. The river broke its banks again in June 2007, cresting five feet below the 1986 level. Bartlesville is familiar with both very hot conditions in the summer with a record high of 115 °F or 46.1 °C and with very cold conditions with a record of low of −28 °F or −33.3 °C. However, even with this record of extremes, the climate of Bartlesville is considered humid subtropical (Köppen Cfa) with cool winters and hot summers, with the majority of precipitation falling in spring, between the months of April and June. Bartlesville lies in Tornado Alley, meaning that severe weather, including tornadoes, can occur. Severe weather occurs most often in the spring months, and occurs with much less frequency throughout the rest of the year. As of the census of 2000, there were 34,748 people, 14,565 households, and 9,831 families residing in the city. The population density was 1,646.4 people per square mile (635.5/km²). There were 16,091 housing units at an average density of 762.4 per square mile (294.3/km²). The racial makeup of the city was 82.09% White, 3.20% African American, 7.18% Native American, 0.96% Asian, 0.02% Pacific Islander, 1.02% from other races, and 5.54% from two or more races. Hispanic or Latino of any race were 3.02% of the population. There were 14,565 households out of which 30.1% had children under the age of 18 living with them, 54.9% were married couples living together, 9.7% had a female householder with no husband present, and 32.5% were non-families. 29.5% of all households were made up of individuals and 14.0% had someone living alone who was 65 years of age or older. The average household size was 2.35 and the average family size was 2.89. In the city, the population was spread out with 24.9% under the age of 18, 8.1% from 18 to 24, 24.8% from 25 to 44, 23.7% from 45 to 64, and 18.5% who were 65 years of age or older. The median age was 40 years. For every 100 females, there were 90.3 males. For every 100 females age 18 and over, there were 85.1 males. The median income for a household in the city was $47,195, and the median income for a family was $56,432. The per capita income for the city was $27,417. About 17.3% of the population were below the poverty line. As of 2010 Bartlesville had a population of 35,750. The racial and ethnic composition of the population was 79.0% White (76.1% Non-Hispanic), 3.1% Black or African American, 8.7% Native American, 1.4% Asian (0.4% Indian, 0.3% Chinese, 0.2% Vietnamese), 2.1% reporting some other race, 5.7% reporting Two or more races and 5.9% Hispanic or Latino (4.5% Mexican, 0.3% Spanish or Spaniard, 0.2% Puerto Rican). Before its merger with Conoco, Phillips Petroleum Company had its headquarters in Bartlesville. After ConocoPhillips formed, the combined company established a global systems and services office in Bartlesville. ConocoPhillips spun most of its operations not related to exploration and production to form a new company, Phillips 66, in 2012. The two companies combined employ or contract with more than 3,800 people in the area. Chevron Phillips also has an office here. Phillips Petroleum had a large presence in Bartlesville. A writer for the Tacoma (Wash.) News Tribune said, "I never quite understood why the town where I spent my high school years wasn't named Phillipsburg. Nearly everything else in town was named after the Phillips Petroleum company or its founder". Price Tower, designed by Frank Lloyd Wright, stands in downtown Bartlesville. It is Wright's only realized skyscraper, and one of only two vertically oriented Wright structures extant (the other is the S.C. Johnson Wax Research Tower in Racine, Wisconsin). The nearby Bartlesville Community Center, designed by William Wesley Peters, one of Wright's students, hosts the "OK Mozart" International Festival, an annual week-long music event in June. Begun in 1985 organized around the music of Wolfgang Amadeus Mozart, the festival features performances of classical music, jazz, light opera, and more. World-renowned musicians who have performed at OK Mozart include Itzhak Perlman, Joyce Yang, Joshua Bell, and André Watts. The Community Center also hosts the concerts presented by the Bartlesville Community Concert Association. The city also hosts several annual festivals and shows, nearly all focused in the downtown. Sunfest is the first weekend of June. It includes an arts and crafts show, a music festival, a kids festival, and a classic cars show. A second classic air show and festival is held in the fall. An Oklahoma Indian Summer Festival is held at the Community Center downtown each fall. Bartlesville's downtown revitalization efforts are in full swing, with many blocks of the National Register Historic District, and the catalyst project, the once burned out May Brothers and 1904 Buildings, coming to completion at the downtown's center. The original Kress Building has been taken over by Bartlesville Monthly Magazine and restored with the Frank Phillips Club on the first floor. The original Jane Phillips Memorial Hospital is about to undergo historic preservation for reuse as lofts, as downtown is so full of young professionals that the many developed historic lofts all have a long waiting list, and nearly 20 new retail and restaurant businesses have recently opened downtown, including Indian Coffee, Lubella's Boutique, and Hideaway Pizza. Downtown Bartlesville Inc., the Bartlesville Redevelopment Trust Authority, the Bartlesville Convention & Visitors Bureau and the Bartlesville Development Authority work in tandem to promote this thriving "Next City". Frank Phillips's former home is a museum maintained by the Oklahoma Historical Society. His ranch and retreat about 10 miles (16 km) southwest of Bartlesville is called Woolaroc (a portmanteau of the words woods, lakes, rocks). A working ranch of 3,700 acres (1,500 ha), Woolaroc houses a museum exhibiting Phillips's extensive collections of Native American, western, and fine art. It holds one of the most complete private collections of Colt firearms in the world. The property includes the Phillips family's lodge and mausoleum, along with a huge wildlife preserve with herds of American bison, elk, Texas longhorn cattle, water buffalo, zebra, and more than 20 other animal species. A Wall of Honor is inside Washington Park Mall, with names of service members listed on panels beside cabinets that display military artifacts, photos, story boards, POW/MIA listings, and other exhibits. A special display honors Lance Corporal Thomas A. Blair, Oklahoma's first casualty during the Iraq War. Bruce Goff designed Shin'enKan ("The House of the Far Away Heart") in 1956. Built for Joe D. Price as his house and studio, it was destroyed by fire in December 1996. Bartlesville is the home of multiple other Goff buildings, a home for the Price Pipe and Supply Family by Frank Lloyd Wright, and numerous homes by the Kansas City architect Edward Delk. The Conference Basketball tournament for The Great American Conference is hosted in Bartlesville. Oklahoma Wesleyan University, a private religious school affiliated with the Wesleyan Church, enrolls about 500 students at the main campus in Bartlesville and about 1000 including satellite and online campuses. About 700 students attend the Rogers State University campus downtown. Career and technical training is provided by Tri County Technology Center, which offers several programs for high-school and adult students along with short-term courses. Bartlesville Public Schools are in the Bartlesville Public School District (BPSD), also known as Independent School District 30. They include six elementary (PreK-5) sites, Central and Madison middle schools (6-8), and the Senior High (9-12). Private schools in Bartlesville include St. John School, a Catholic school, Coram Deo Classical Academy, and the Wesleyan Christian School, which is affiliated with First Wesleyan Church. Some students also attend Tulsa-area private high schools. Boots Adams, business executive and civic philanthropist of Bartlesville, Oklahoma. Bud Adams, owner of the Tennessee Titans; enrolled Cherokee, grew up in Bartlesville. Ted Hsu, Retired Member of Canadian Parliament for the riding of Kingston and the Islands. Pathfinder Parkway - Bicycle and jogging path which runs throughout Bartlesville. ^ "Delaware (Lenape)." Archived 2015-02-25 at the Wayback Machine USGenWeb. January 2, 2015. Retrieved February 24, 2015. ^ a b May, Jon D. "Bartlesville." Encyclopedia of Oklahoma History and Culture. Retrieved January 15, 2012. ^ Khawaja, Shehla. "Bartlesville Telemovie Experiment Collection". The Barco Library Archives. CableCenter.org. Archived from the original on 2011-09-28. Retrieved 31 July 2011. ^ "BARTLESVILLE F P FLD, OKLAHOMA (340548)". Western Regional Climate Center. Retrieved September 10, 2016. ^ "American Fact FInder". United States Census Bureau. Retrieved 2014-02-01. ^ "Census Fact Finder". Archived from the original on 2014-12-18. ^ "Who We Are." Phillips Petroleum Company. January 11, 1998. Retrieved on January 16, 2010. ^ "Contact Page." Phillips Petroleum Company. April 20, 2000. Retrieved on January 16, 2010. ^ "ConocoPhillips Announces Museum Plans For Ponca City and Bartlesville Archived 2011-07-27 at the Wayback Machine." ConocoPhillips. May 13, 2005. Retrieved on January 22, 2010. ^ "Largest Employers in the Area Archived 2013-08-08 at the Wayback Machine." Retrieved May 22, 2014. ^ "When Phillips Pulls Out of Bartlesville, You Know Nobody's Safe". News Tribune. Tacoma, Washington. December 5, 2001. Retrieved February 3, 2010. ^ a b Downtown Bartlesville Inc.
^ Sunfest Website. Retrieved March 28, 2010. ^ Indian Summer Website Archived 2010-10-09 at the Wayback Machine. Retrieved March 28, 2010. ^ Angelou Economics Study, new, and Downtown Bartlesville, Inc.
^ Bartlesville Area History Museum. ^ "Bartlesville Public School District". Bartlesville Public School District. Retrieved 2012-03-06. 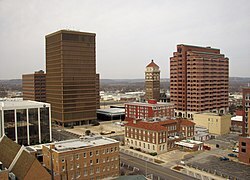 Wikimedia Commons has media related to Bartlesville, Oklahoma.